Girl Scout Troop 6000 based out of New York City is having its first-ever cookie sale this week, which is momentous for several reasons, but mostly because Troop 6000 was created so that New York City’s homeless population could have a Girl Scout troop of its own. Troop 6000 was created by Giselle Burgess in February 2017 when she and her five kids suddenly became homeless. She became the troop leader, her three daughters joined, and now the troop has nearly 300 members across 12 chapters serving girls across New York’s homeless shelters. This week, the troop launched its first Girl Scout cookie sale and has already reached its goal of selling 6,000 boxes. Buzzfeed News reports that the cookie sale is being held at Kellogg’s Cafe off Union Square and the girls will be there through Saturday, April 14th, 2018 if you want to support Troop 6000. For many of the girls, this is their first time joining the Girl Scouts, and many remain in the troop even once they are no longer homeless. Burgess says that even with the growing numbers, the girls in the troop say it feels like a sisterhood. "The difference I’ve noticed in the Troop 6000 girls is there’s a stronger sisterhood that’s in there that the girls are taking back from this. They don’t feel alone," she told Buzzfeed. 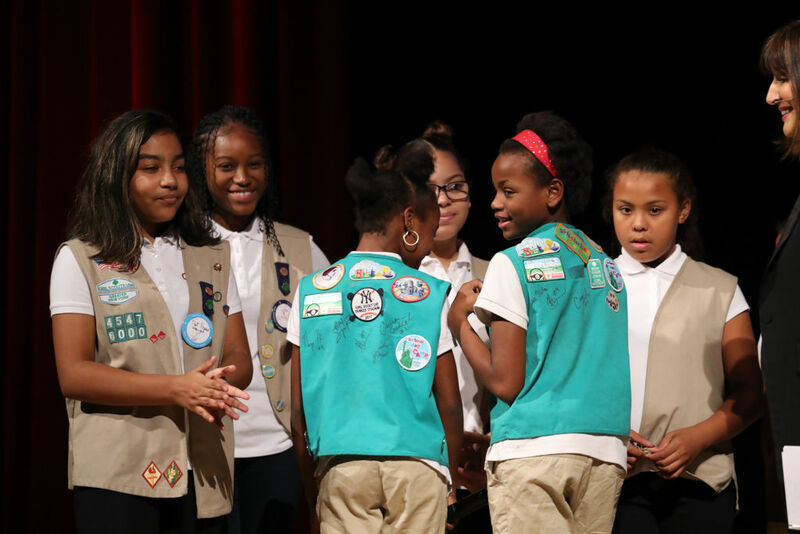 Sanaa, one of the troop’s original members, says she’s grateful for Troop 6000 because she never has to hide her family’s housing situation with the other girls in the troop. "It was fun, because then I had some girls I could talk to about the situation that I had, and that I wouldn’t have to hide it or feel that I was different," Sanaa revealed. "Before there was Girl Scouts, I would have to hide it away when I went to school, and I had no one to talk to."